I want to partner with you to become the fit and healthy person you want to be. No fads, no gimmicks, just the science and the personal attention you deserve from a caring and knowledgeable trainer. 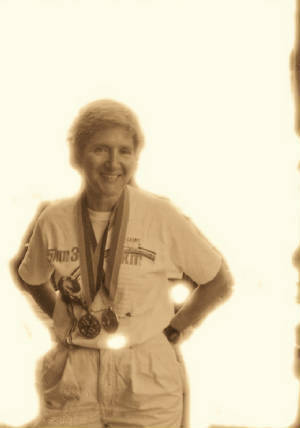 I began running competitively in the early 1970's. I began biking in the '80s, and found myself competing in duathlons. I qualified for and competed at the Coors Light National Biathlon Championships in Phoenix in 1989. I gradually shifted my interest to bike racing, and competed successfully for several years in the masters cycling competition at the Empire State Games. It was an activity I truly loved - like one or more sports / fitness activities you all can name as "yours". Off and on since the '70s, I would start to work out using machines and/or free weights. I worked with several personal trainers and at many gyms and at home. Like many of you, I believed in the "no pain, no gain" school of training. And, like many of you, I soon would end up sore or injured, and that would be the end of that attempt at resistance training. After many years of running and biking, my knees gave out. I gained over 40 pounds, because of my forced inactivity and poor eating patterns. After suffering for almost a decade, I looked again to resistance training to help rehabilitate my knees and to lose the weight I had gained. I found a personal trainer who was certified by the International Sports Sciences Association ("ISSA"). He showed me a method of resistance training that was safe, effective, and energizing, rather than painful. After years of starting, then stopping weight training, I was able to continue to train consistently for over a year. At that point, I realized that I wanted to become an ISSA-certified trainer, so that I could share this method with others. I became certified in 2006. I have continued my studies with Dr. Jack Barnathan, "the Strength Doctor" and founder of New York Strength, Inc. "Dr. Jack" is a chiropractor and power lifter, who works with many Olympians and other elite athletes. He has seen first-hand how poor training regimes can lead to injury, and he passes along to his students the importance of good form and technique in developing strength and preventing injury. In my previous career I was an attorney who found joy in helping people come together and find common ground upon which all could grow. I view fitness training and wellness coaching in a similar light. I know personally the struggle to balance personal life and work, to find the time to take care of oneself. I have walked the weight-gain/weight-loss road and know what works and what does not. Helping people restore the strength and balance in their bodies, to find their "inner athlete," is not just a job with me, it's a passion. My partnership with my clients does not stop at the gym door - I am constantly scouring the literature for the latest information on fitness and health to share with them. If you would like to build lean muscle, lose fat, become faster and stronger for your sport, or simply become more fit for the activities of daily life, please talk to me about the Esopus Strength and Fitness "system."